We left Key West and headed for Guatemala flying close to the Cuban coast. After crossing the Gulf of Mexico we passed over Cozomel Mexico and Belize then on directly to Tical Guatemala. This was the first place I used the Iridium Telephone. It made my wife happy to know that we had arrived in Guatemala OK. From there, we went on to Honduras and the runes in Copan. 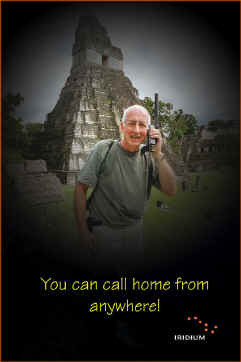 I called the office and home from the runway in Copan. In fact, I was able to get important weather and flight planning information in places where just a few years ago it would have been impossible. After Honduras, it was on to Nicaragua to the city of Managua. Again my partner and co-pilot were able to call our wives and let tem know of our location. Then it was on to Panama and Contadora Island. This island is about 40 miles off the coast of Panama and really is a beautiful resort. The fowling day we had a tour of both the Panama Canal and downtown Panama City. We were hosted by the minister of aviation and were greeted by president Mireya Moscoso. The change in Panama is evident with the change of control of the Canal. The emphasis is on tourism and economic development. The attitude in Panama, as well as the rest of the countries that we visited, was warm and friendly. The prices for aviation fuel were in most cases less than in the states. In addition, the cost for hotel accommodation as well as food was very favorable. After Panama, we flew up the western coast of Central America to Costa Rica. We landed in San Jose and visited Sugar Beach, a fine resort right on the Pacific Ocean. We were supposed to go from Costa Rica to Rotan Island in Honduras. I elected to return to Guatemala City for a few days of good weather. Hurricane Lenny stalled over Rotan and it made no sense foe us to spend tree days in the rain. We toured Guatemala including Lake Alticlan and the old capital of Antigua. Guatemala is a most beautiful country with friendly helpful people not to mention that $1.00 is equal to $7.50 in the local currency. When we were ready to fly back to the states, we used the Iridium Telephone to get weather and to inform the customs people of our estimated time of arrival. Let me tell you that knowing the US customs people are ready for your return to US soil is a great comfort. I distributed all of the collateral material you provided, do not be surprised if you get some calls from other pilots wanting to rent or buy equipment. I have attached a jpg file you may find amusing. I did a lot of Photography and we truly enjoyed the trip. Having the Sat Telephone with us made us feel much more secure. The telephone and my aircraft worked perfectly. I hope to do more of this kind of trip in the future. I have gotten in contact with other flying adventure groups both here in the states as well as in Africa. Again I thank you for the service and I take every opportunity to inform my fellow pilots that this technology is available and affordable.